This interview was conducted by electronic mail. Questions were composed by the Hammer’s new media associate Amanda Law. For her Hammer Project, The Electric Comma (an ongoing series), LA artist Shannon Ebner investigates the correlations between photography and language. Read more in an essay by senior curator Anne Ellegood. AL: Where does your interest in language come from? SE: I never know how to answer this question and believe me, you are not the first person to ask it of me. All I can say is that even though I distrust language and think that there is too much of it, I also think that it can do things not just through its meaning, or variations of meaning, but also how it can exist as a sculpture, an image, and as a material. AL: When I first saw your work; I thought of old telegrams in which the word “STOP” indicated a line break or a period. When you spell out forms of language, such as "asterisk" and "comma," are you thinking of earlier forms for distributing information like telegrams? SE: I like the association of old telegrams and while it was not so much what I was thinking about directly, it is not far off. When I spell out punctuation, I am curious to see how it will function within the context of an exhibition and how it might move or delay the reading of the work and in this way begin to form something else. I find that I am less and less interested in the singular image and instead in the possibility of a photographic sentence where images can act as units to build something. 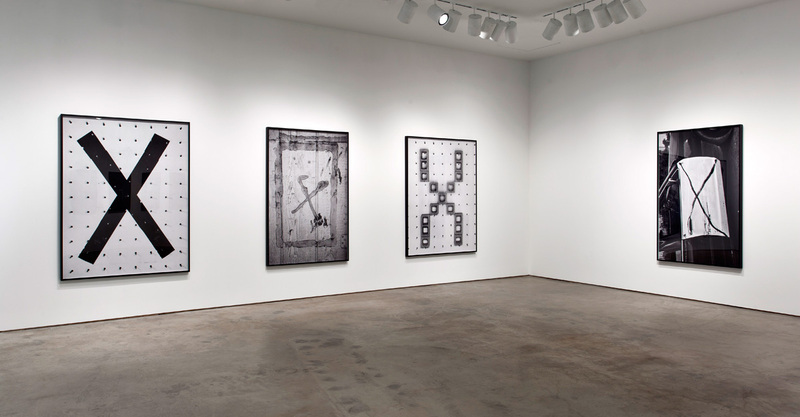 Hammer Projects: Shannon Ebner. Installation view at the Hammer Museum, Los Angeles. July 15 - October 9, 2011. Photography by Brian Forrest. AL: When you build letters in your studio and photograph them and then combine these photos to form words or sentences, are you trying to reduce language to a unit? Do you see this as having a relationship to Minimalism? SE: I was trying to reduce images and language to units, as in movable parts. I don’t necessarily differentiate between the two. The work is made serially; using readily available industrial materials and so it does share some of the concerns with Minimal Art if one were to think really abstractly about the conditions that produced Minimal Art. However, there are specific conditions that I was reacting to that are really different from that time. These things were very incomprehensible to me photographically, and elicited in me an austere response. And so I ended up making my own blank field – a wall of steal pegs that supported the weight of many cinderblock – a grid to support language, without a ground. When I first made the cinderblock alphabet in 2008 it was for a piece called STRIKE which was made of eighteen broken palindromes. For me a palindrome is one manifestation of the objecthood of language because it gives language a form much in the same way that Minimalist sculpture functions to make a space for something that barely exists. I guess the last thing I will say about this question of the unit and the works relationship to Minimalism is to just mention that both the Bechers ‘Anonymous Sculptures’ and Bochner’s foray into photography were really important to the STRIKE piece. Shannon Ebner. XIS, 2011. Chromogenic print, 160 x 122.5 cm. AL: Can you describe some of your aesthetic decisions, like working with black and white images? 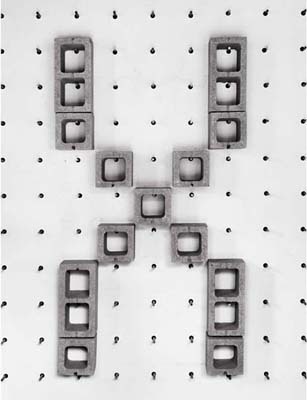 For your constructed photographs (the STRIKE alphabet), why did you decide to use cinderblocks, pegboard, and nails? Was this partly functional or do these materials serve an aesthetic and purpose as well? What associations does the cinderblock carry for you? SE: At first my use of black and white photography had more to do with a resistance to color but I have come to realize in recent years that it has more to do with indeterminacy. The STRIKE piece is about war and was made with the language and materials of war. I also used cinderblocks because of their relationship to economy. They are cheap and readily available all over the world. They also look like pixels and this too was important. In terms of the steel pegs and the grid, I had been interested in this idea of a grid supporting language and had begun to explore that idea in earlier photographs and projects. The modularity of the cinderblocks and the grid support structure also made it possible for me to economize my materials – the same twenty blocks could form the letters for the entire alphabet and this was exciting for me. 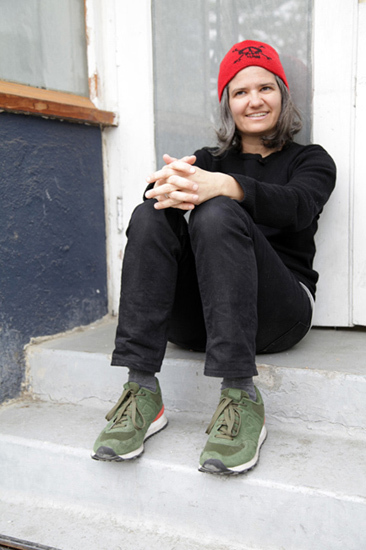 Hammer Projects: Shannon Ebner. Installation view at the Hammer Museum, Los Angeles. July 15 – October 9, 2011. Photography by Brian Forrest. AL: I love the light boxes in the Hammer courtyard. The light sequencing is very engaging. Have you made light boxes or worked with light before? Can you describe the lighting sequence and how it works? SE: I am interested in the relationship between how we receive images cognitively and perceptually and how lighting conditions in an exhibition can function to complicate the instantaneous reading or decoding of an image. I am also interested in images as signals for thought and in this way lighting patterns or sequences of light can be signals for this type of activity. The lighting sequence for the boxes is loosely based on a premise of Claude Shannon’s. Shannon was an information technology pioneer who started publishing in the 30’s and one of the problems that he was trying to solve was how to design a system that would account for information loss. If you have a message that needs to go through a signal channel from the sender to the receiver how do you account for the noise in the signal channel that will result in information loss for the receiver of your message? What Shannon realized is that by incorporating a certain amount of redundancy into the signal which corresponds to the amount of noise in the channel that it would combat the amount of information lost. In researching Shannon I came across a paper that he published in 1950 called “Prediction and Entropy of Printed English.” I can’t understand large portions of it because it uses mathematical theories to prove his ideas about communication but it is trying to quantify the ideas I was just talking about in terms of information loss (entropy) and redundancy. Shannon was trying to prove that it is possible to predict the next letter of a word when the preceding text is known. What interested me about this claim though is that in order to prove the theory Shannon included the space in between words as an additional letter, a twenty-seventh letter of the alphabet. 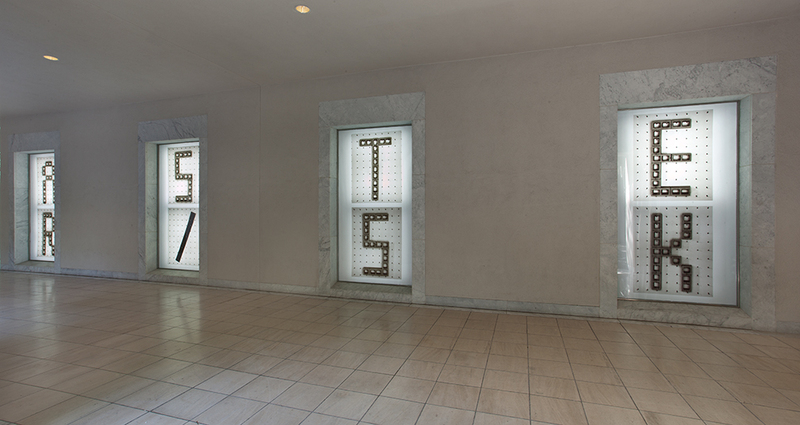 For this reason the sequence of lights for the Hammer piece is based on this blank space, the twenty-seventh letter, which could also be called a comma, a pause or a delay. AL: What is the meaning of the asterisk in your work? Can you tell us a little bit about the form of the asterisk and its history? SE: The asterisk interests me because it redirects sight. If an asterisk is used as a footnote in a text it redirects your sight to a different site in the text in pursuit of other information that is relevant to the text. For the purposes of photography the asterisk looks a lot like the sun typographically but on a much more manageable scale. Even though the sun is responsible for vision and for photographic exposures, we can’t actually look at or touch the sun and so it too directs our vision away from its source.